Home / Thai herb / 7 nutrients that rich value in Moringa in one step service. Moringais both vegetables and herbs with nutrients and energy, vitamins, minerals, and delicious food in Thai kitchen for a long time. Moringais well known and you know about all parts of this herb that is useful to all are barks, leaves, and sheathes. You may ever eat Curry Moringa before, but only few people know that this herb contains some nutrients. You’d be amazed that you want to go to the market to buy it for cooking. Those are all nutrients necessary and important for the body. Let’s see what! The vitamins necessary for the body was found in Moringa. Vitamin A is a treat the eyes and skin moist. Moringa has a lot of vitamin A that keep your eyes to be treated as vegetables and fruits. Vitamin B2 is an important vitamin that can create the energy and change starch to be sugar. So if you lack vitamin B2, like a lack of energy and weakness. In Moringa, it is rich in vitamin B2, in the quantity as well as vitamin A.
Vitamin B6is another nutrient that can treat the function of the nerves and the brain. In medical, they use this vitamin in the form of vitamin B1-6-12 in the treatment of patients with stroke. It is known as the vitamin for treatment. Vitamin C :we heard that vitamin C solve the flu, besides that, it also stimulates the immune system to work better. At least, the girls are like so much is that it helps in the synthesis of collagen to the skin, making beautiful skin, and lots of vitamin C -rich in the most of Moringa leaves. Nutrients in Moringa that you don’t lack. Magnesium is an important nutrient for energy to the muscles and nervous system. If you lack mineral, it can cause muscle weakness or without much that effect on the nervous system and thinking. So you should not lack Magnesium. Iron is necessary nutrients to create another red blood cells. Therefore, those who lacks the iron, it makes pale skin easily and it affects to weakness, tried, and dizziness. Some people who lack much to give blood. Protein: it’s difficultly believed that herbs have protein and contain a significant proportion is 21 grams of protein, is Moringa leaves 2 grams, is considered enoughfor the plant proteincomponent. The function of protein per body that would not describe what. It also provides energy and repairs nails, hair strength, and the wound is gone easily. These are nutrients of Moringa that needed to 7 types, like shooting up to 7 birds with one stone, because each nutrient without this is big.The scientists and academician discovered for herbs to maximize the benefits. 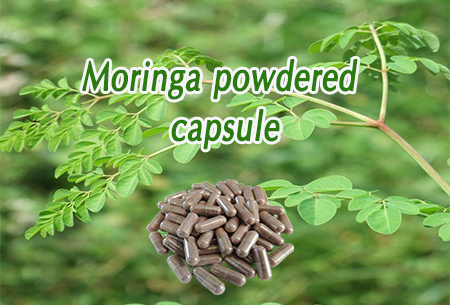 Moringa is both vegetable and herb that givesexcellent nutrients like one step service. This entry was posted in Thai herb and tagged healthy, herb, Herbal, Moringa. Bookmark the permalink. ← 8 properties of PluKaow take care of your health incredibly.